Especially when they are like the one above. This was a find from the YA section this last week. Now, I just don’t love to delete books because I’m some sort of terrible, book-burning fascist. I’m not. There are methods and guidelines for weeding books because we just don’t have enough space for all books ever written and sometimes those books don’t deserve to be on the shelf. Here’s one guideline that I use: MUSTIE. If a book has one or more of these traits and isn’t a “secret classic,” toss it! I would say that this book is Ugly, Superseded, Trivial, and that type of book is Elsewhere. The other guideline I use is based on the MUSTIE principle: if it is more than 10 years old, I’ll pull it to see if it has been checked out in the last 3 years. 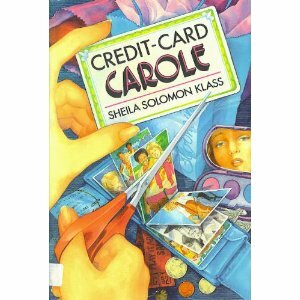 three years is pretty generous and if it hasn’t circulated and isn’t a classic or a secret classic, bye bye Credit Card Carole! Some books are crappy. They need to make space for more, better books. So say we all. I am so with you on this. The first time I threw a book away, I thought I would surely be hit by lightening, but it was so d*** liberating. Woo hoo. Now I just buy potentially crappy books electronically so I can just delete them. Yippee.